A good Christmas book for the dog and cat loving children in your life. Santa is sick, daughter takes his place, mean reindeer leave her on top of a roof with no way to fly, she gets help from homeless cats and dogs. They fly. (Yeah right!) Then they finish delivering the presents and take her home to the North Pole. The reindeer are grumpy, yet they never get what's coming to them AND they never apologize. What is this teaching kids exactly? Give homeless animals a home=good message. It's ok to be a grumpy reindeer and abandon people=Not a good message. It was the night before Christmas and Santa was sick. He sneezed, he coughed, he groaned, he moaned. He sniffled and he blew.And there was no way his daughter, Jeannette, was letting Santa out in the sleigh that night. Jumping jingle bells, if Santa could do it, so could she. Sure, the reindeer are tricky and none too fond of their work. But Jeannette was a Claus and it was Christmas. This was kind of her thing.But when the sleigh is still more than half full of presents, the reindeer decide to jump ship and Jeannette is stranded with a big sleigh and no one to pull it. 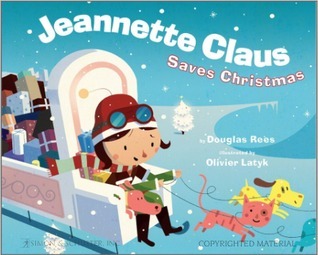 Unless a few stray cats and dogs can help Jeannette to turn a really bad Christmas Eve into a really successful one without the help of those pesky reindeer in Jeannette Claus Saves Christmas (2010) by Douglas Rees and Olivier Latyk.I'm a fan, first and foremost, of traditional Christmas stories. "Twas the Night Before Christmas" is an annual favorite. As far as reimagined (or even slightly fractured) Christmas stories go, this is a fun one. Latyk's illustrations--sketched in pencil and then rendered in Photoshop--are original and provide a unique vision of iconic holiday images including the jolly man himself and, of course, the reindeer.Rees' story is also a new take on the holiday theme. Jeannette is a winner and the text lends itself to reading aloud with natural pauses and good pacing. The premise isn't my favorite--misanthropic reindeer feel . . . odd (and they're really mean!) --but it is a fun twist for anyone looking to go beyond the familiar songs and stories with their holiday reading. Of course, more astute readers will be left to ask, where's Rudolph when you really need him?This book was received for review at Simon and Schuster's Fall 2010 preview in May. This is more of a 3.5 if I'm to be honest. The illustrations are awesome - both Julia and I really loved how colorful, bright, and so much fun they are. The story had a few weak points I think. I don't know how I felt about the reindeer leaving Jeannette. I think I'm having a hard time with it because well, I want to believe the reindeer want to be on their job, not being forced to take Santa's sleigh all over the world. Dasher actually telling the others to leave left a bad taste in my mouth. To be fair, this was all needed for the twist that comes afterwards but I have to think that it could have been worked around, even if a new twist entirely was brought it. I did, however, love the stray dog and cat part of the story and Julia loved it so much she talked about it for quite awhile afterward. Maybe I'm being too harsh on the reindeer? This isn't only a fun book for holiday reading, a few good points can be brought up and talked about, which my daughter knows only too well. How Jeannetter finds a way out of her situation, instead of just giving up, is the main one IMO. I'm still not all the way, or even a little, honestly, comfortable with angry reindeer. It just doesn't fit the picture in my head. I don't want anyone to think this isn't appropriate - it is - take a look first and don't just let the words "angry reindeer" make your decision. It's 100% okay for any age group IMO, this is just an issue with me. (On one of the last few pages one of the reindeer is looking down at a poor little oblivious bunny and I think he wanted to eat him, or bite his head off at the very least.) All in all it's one of the best that we've read this year - in terms of story and illustrations. Jeanette Claus, Santa's daughter, has to take over on Christmas Eve because her dear old dad has a cold! Things are going alright for determined little Jeanette, until the reindeer get loose (All of whom, for some reason, don't like working for Santa and are all rather mean-spirited). But Jeanette Claus is determined to finish her rounds before dawn and finds a way to make it happen.While the story is cute, it just didn't grab me in any real way and I was honestly put off by the inexplicable rudeness and near-hatred the reindeer seemed to have for the Claus family. While I wouldn't advise avoiding this book, I'd certainly recommend others over this one in particular. My students and I loved this Girl Power book. Lesson ConnectionsOne of the Christmas gifts I give my students each year is an extra read aloud every day from the weeks after Thanksgiving till Christmas break. I gather lots of Christmas story books and read one a day. It makes us all happy and the season more celebratory. This is a cute christmas story, but I wished they had not used to word stupid. That just lowered my overall thoughts. I liked the dogs and cats saved Christmas! Douglas Rees Olivier Latyk - I was born on October 19th, 1947 in the hospital at March Air Force Base just outside Riverside, California. My father, Norman, was a career sergeant who'd served as an aircraft mechanic and infantryman in the Philippines campaign early in the war and was taken prisoner on Bataan. My mother, Agnes, was a nurse at the hospital where he was sent to recuperate after the war was over. Until I was fifteen, I lived on or near a number of Air Force bases in this country and in Germany. My sister, Patricia, was born in 1950 at Travis AFB. Until I was six, I wanted to be a fireman. Between six and twelve, I wanted to be a paleontologist. When I was twelve, I decided I wanted to be a writer. I still haven't outgrown that. I made some occasional stabs at writing and submitting manuscripts in my twenties and thirties. When I turned forty-seven, I decided to start writing things more regularly. I've been doing so ever since.